At New Day Packaging Products, we're a worldwide distributor for fastening solutions used in demanding industrial environments. 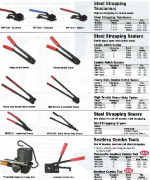 Our dual lock fastener line acts as a suitable alternative to zippers, screws, snaps, and bolts. Highly flexible, these fasteners provide fast product assembly for a variety of applications. They help to eliminate misalignment while maintaining consistent engagement without premature separation. Sold in rolls or mini dispenser packs, they're designed to provide an audible snap sound that signifies a secure closure. Dual lock fasteners are sold in either black or clear colors. 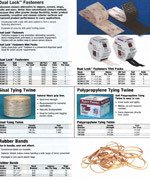 We also offer a complete line of twine products for an array of tying applications. Our sisal twine is made with natural fibers that are biodegradable and ideal for balling and bagging nursery stock. Versatile for any industrial application, sisal twine offers great knot strength that ensures a tight fit around objects. With our polypropylene tying twine, objects can be confidently secured in environments where mildew, rot, and moisture are prominent. Available in carton containers, polypropylene twine can be pulled to desired lengths and easily stored. For bundling, sealing, and attaching, our economical rubber bands are sold in cases with a total of ten separate one pound bags. They offer superior stretch characteristics and durability. 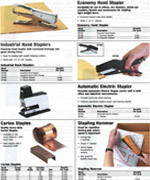 Available in a variety of sizes, these reusable bands can help secure a wide range of items and are a great multi-use product for any warehouse, office, or factory operation.